Sandringham01485 545408work Historic HouseStill maintained in the style of Edward and Alexandra, Prince and Princess of Wales (later King Edward VII and Queen Alexandra), all the main ground floor rooms used by The Royal Family, full of their treasured ornaments, portraits and furniture, are open to the public. The Museum, housed in the old stables and coach houses, has a collection of vehicles ranging in date from the first car owned by a British monarch, a 1900 Daimler, to a half-scale Aston Martin used by Princes William and Harry as well as a photographic exhibition which shows the history of Sandringham House from 1870 to the present day. A display tells the mysterious tale of the Sandringham Company who fought and died at Gallipolli in 1915 and there is also a fascinating collection of gifts given to Her Majesty The Queen by people from all over the world. The sixty-acre gardens include the formal North Garden, the Stream Walk and Queen Alexandra’s Summerhouse, perched above the lake. The formal planting of the Edwardian age has given way to great sweeping glades, bordered by splendid specimen trees and shrubs, to create an informal garden full of colour and interest throughout the year. A free shuttle from within the entrance will carry passengers less able to walk through the gardens to the house and back. Guided garden tours take place on Wednesdays and Saturdays at 11am and 2pm. Still maintained in the style of Edward and Alexandra, Prince and Princess of Wales (later King Edward VII and Queen Alexandra), all the main ground floor rooms used by The Royal Family, full of their treasured ornaments, portraits and furniture, are open to the public. Sandringham Church is also well worth a visit, and there are six hundred acres of the Country Park open to all. There is a café, coffee shop and gift shops close to the coach and car parks. 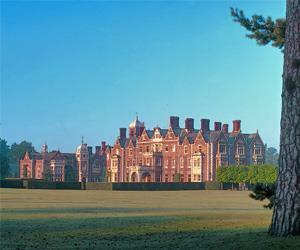 Sandringham’s welcoming country house atmosphere is commented on by almost every visitor, and the most common complaint is that people have not allowed enough time to see everything there is - at least 3 hours is necessary, and there is enough to fill a full day’s visit. No photography in house. Corporate Hospitality/Functions: Visitor Centre only. Suitablity for the Disabled: WCs. Refreshments/Cafe/Coffee Shop: Licensed. Guided Tours: By arrangement. Private evening tours. Parking: Ample. Suitability for Dogs: Guide dogs only. From the B1440: Follow brown signs from A148 or A149. From King's Lynn station it is 8 miles to Sandringham. Bus no. 35 from King's Lynn or Hunstanton. Visitors should be aware there are long distances involved. Shuttle service available (FOC).